In the basement of the Gates Computer Science Building at Stanford University, a screen attached to a red robotic arm lights up. A pair of cartoon eyes blinks. "Meet Bender," says Ajay Mandlekar, PhD student in electrical engineering. 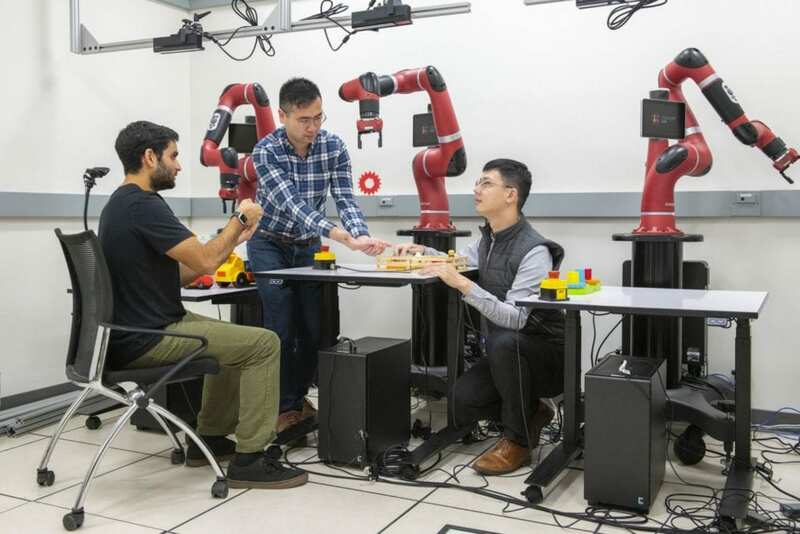 "With RoboTurk and SURREAL, we can push the boundary of what robots can do by combining lots of data collected by humans and coupling that with large-scale reinforcement learning," said Mandlekar, a member of the team that developed the frameworks. However, those lessons aren't always perfect. When Zhu pressed hard on his phone screen and the robot released its grip, the wooden steak hit the edge of the bin and clattered onto the table. "Humans are by no means optimal at this," Mandlekar said, "but this experience is still integral for the robots." "With SURREAL, we want to accelerate this process of interacting with the environment," said Linxi Fan, a PhD student in computer science and a member of the team. These frameworks drastically increase the amount of data for the robots to learn from. "The twin frameworks combined can provide a mechanism for AI-assisted human performance of tasks where we can bring humans away from dangerous environments while still retaining a similar level of task execution proficiency," said postdoctoral fellow Animesh Garg, a member of the team that developed the frameworks. "You shouldn't have to tell the robot to twist its arm 20 degrees and inch forward 10 centimeters," said Zhu. "You want to be able to tell the robot to go to the kitchen and get an apple."